An impression of paradise in the Mediterranean Sea, the Greek Islands beckon visitors with sun-kissed scenery and a balmy Mediterranean climate. Serene stretches of calm azure waters surround the islands, which are dotted with quaint fishing ports and historic villages. Most tourists focus on the beaches during summertime, however the countryside offers an abundance of treasures: Byzantine chapels, secluded medieval monasteries, and archaeological ruins. The sights are spectacularly photogenic because of the vibrant, saturated colors. Little white cubic houses feature red, green, or blue-painted shutters; outdoor terraces are draped in canopies of bright purple bougainvillea; and hilltop churches have blue domes that mirror the indigo waves in the background. Santorini is the most evocative island because of its picturesque cliff-clinging towns and stunning volcanic landscape. Famous beach-vacation destinations include Mykonos and Corfu. The ancient islands of Crete and Rhodes boast fascinating cultural attractions, while idyllic Naxos and Sámos are blessed with natural wonders. The song of mythological Sirens seems to whisper in visitors' ears as they sail towards Santorini. Soaring up from the deep blue seas, this spectacular island is a beautiful and enchanting destination. Some scholars believe this is the legendary island of Atlantis, because it was formed by a sudden volcanic eruption around 4,000 years ago. The peak of an enormous volcano, the island's dramatic hillsides of dark volcanic rock give way to the massive caldera (the world's largest) where the sea is so tranquil that it appears to be a gigantic lake. The most exciting way to arrive in Santorini is by boat and then take a donkey ride up the steep switchback road to Firá or an equally daunting bus ride with hairpin turns. Santorini's must-see destination, Oia village is a small piece of paradise in the Aegean Sea. With stunning views at every turn, this picturesque whitewashed town clings to the rim of the volcano's basin. Nearly any spot in Oia looks like the image of a postcard or painting. Humble cube-shaped houses are clustered together on the hillsides high above the sea, and iconic blue-domed churches overlook the caldera's serene blue waters. Instead of roads, the village has steep pedestrian staircases and narrow cobblestone lanes. The "main streets" of Oia are lined with traditional restaurants and small boutiques selling handcrafted jewelry, artisan products, clothing, and souvenirs. In the evening, Oia has a romantic ambience and is a great place for a leisurely dinner in traditional Greek style. Many tourists time their visit for sunset. Find a restaurant with a panoramic terrace and make sure the meal coincides with sundown, or stand at a viewpoint waiting for the moment. The capital city of Santorini is Firá. Although its center is more modern and less charming than the village of Oia, the historic section of town perched on the cliff tops is unforgettable. Whitewashed houses cling to the steep hillsides, and many hotels, restaurants, and cafés have terraces with sensational views. Firá boasts the superb Museum of Prehistoric Thera, which displays objects uncovered at the Akrotiri archaeological site. The ancient ruins of Akrotiri (at a separate location) are also open to the public. Near Firá, other little villages are nestled along the rim of the caldera all the way to Oia. Tourists can take a scenic walk from Firá to Imerovigli, a quiet village with quaint blue-shuttered white houses trimmed in bougainvillea. Other top tourist attractions in Santorini are Kamari Beach with volcanic black-sand shores and Ammoudi Port, the scenic old harbor with wonderful waterfront tavernas that serve fresh local seafood. For fun-loving, sun-worshiping tourists, Mykonos is the place to be. This beautiful island in the Aegean Sea offers the most happening vacation scene of the Greek Islands with many trendy restaurants, atmospheric tavernas, and live entertainment venues. Most tourists head to Mykonos for the beautiful beaches and summery weather from July through October. Mykonos is also famous for its beach clubs at Paradise Beach. Nearby are three other beaches accessible by boat as well as by car, including Super Paradise Beach and Elia Beach, the island's longest beach and one of its best. At Elia Beach, vacationers should indulge in gourmet cuisine at the acclaimed Elia Restaurant, which serves enticing Greek specialties on a covered terrace overlooking the sea. Another top tourist attraction of the island is Mykonos Town. This historic town is a delightful traffic-free labyrinth of winding cobblestone lanes and whitewashed houses. Wandering around the pedestrian center of town, tourists will discover quiet squares with lovely old churches and alleyways draped in bright fuchsia bougainvillea. Terraced cafés and little tavernas are tucked away in narrow side streets. Discoveries of local clothing boutiques, jewelry shops, and artisan stores reward tourists who spend time wandering around. Be sure to see the Little Venice area with balconied buildings that resemble Venetian edifices because of their waterfront facades, and the Church of Panagia Paraportiani with its distinctive whitewashed stucco architecture. On a prominent hilltop location stand the emblematic windmills, once used to supply power to grind grain and now a favorite spot for tourist photo-ops. While staying in Mykonos, an essential sightseeing stop is a guided tour of Delos Island. A quick boat ride away from Mykonos, Delos is one of Greece's most important archaeological sites. Today, the island is completely barren and uninhabited but it was once a center of spirituality and commerce. In the seventh century BC, Delos was considered a sacred island. According to mythology, it's the birthplace of twin gods Apollo and Artemis. During the third and second centuries BC, the island had booming trade that attracted merchants from faraway lands such as Alexandria (of present-day Egypt) and a noteworthy Jewish community with the first synagogue of the diaspora. The population grew to around 25,000 inhabitants (enormous for the ancient world). The island's most famous ancient ruins are the Lions of Delos, marble statues that stand guard over the Sacred Lake. Tourists can also see remains of the Sanctuary of Dionysus, agoras (marketplaces), gymnasiums, temples, and houses with exquisite mosaics. The Archaeology Museum has a wonderful café, which serves free-squeezed orange juice on a patio terrace overlooking the ruins. Packed with cultural attractions, Crete is the largest of the Greek Islands and could be a vacation destination in itself. In the Aegean Sea between Europe, Africa, and Asia Minor, the island has been a crossroads of humanity since Neolithic times. Minoan Civilization flourished here around the 20th century BC and a successive parade of conquerors left their mark: from the Dorian Greeks to the Ottoman Turks. The historic town of Chania reveals the island's rich and diverse heritage. Its winding streets are filled with elegant Venetian mansions, splendid churches, and impressive fountains. An old Jewish quarter lies in the southeast section of the old town, and the former Turkish quarter in the Splantzia district has the only Christian church allowed during the Ottoman rule, Aghii Anargiri. Must-see sights are the archaeological museum in the 14th-century Aghios Fragkiskos Church and the Folklore Museum. The largest city of Crete is Heraklion, which dates to the ninth century and has influences of Arabic, Venetian, and Ottoman civilizations. Surrounded by fortifications built by the Arabs, the town is a treasure trove of historic monuments. HIghlights include the 16th-century Venetian Loggia, the 14th-century Church of Saint Mark, the Morosini Fountain, the 13th-century Church of Agios Markos, and the Monastery of Agios Petros and Pavlos. Also be sure to visit the Museum of Cretan Renaissance in the former Church of Agia Ekaterini, the archaeological museum, and the aquarium. About five kilometers southeast of Heraklion, the palace of Knossos is Crete's largest and best preserved Minoan site. Crete boasts gorgeous natural scenery of rugged mountains and magnificent beaches. The balmy climate nourishes plantations of tropical palms and bananas, olive groves, and orange orchards, all used in the island's delicious cuisine. For nature walks and hikes, head to the majestic White Mountains (Lefká Óri) National Park. Between this mountain range and Mount Psilorítis is the remote Réthymno region, which has one of the most well-preserved medieval towns in Greece, the historic city of Réthymnon. 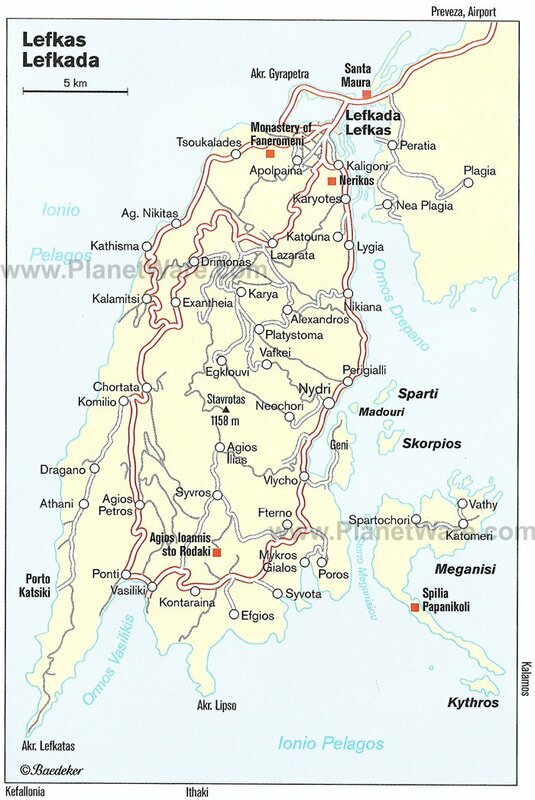 This region also has many ancient monasteries and hilltop villages where Cretan melodies originated. Along the Réthymno coastline are beautiful beaches, especially around Ayía Galíni and the coastal villages of Pánormos and Plakiás. 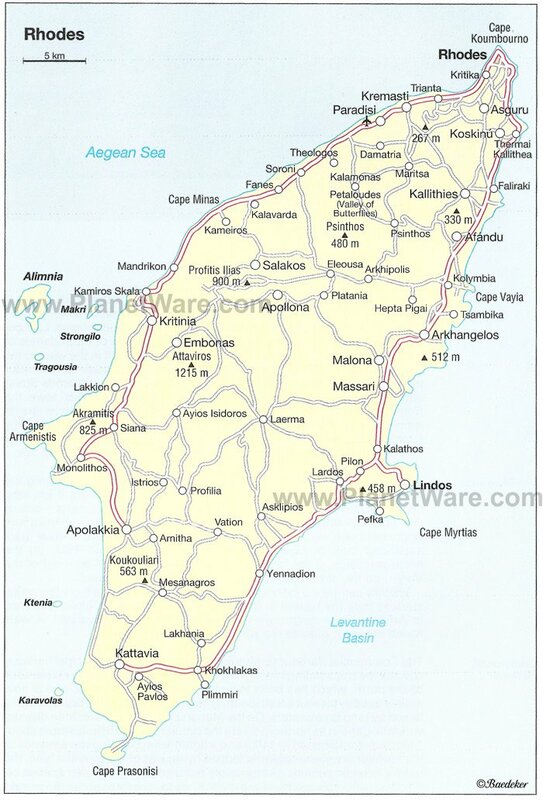 In the easternmost part of Crete, the Lassíthi region has many beautiful seaside towns, including the leisurely seaport of Áyios Nikólaos, the bustling coastal town of Ierápetra, and the beach town of Sitía. The Lassíthi region is prized for its pristine beaches with crystal-clear waters, ideal for snorkeling. Known as the "Island of Roses" because of its beautiful flowers, Rhodes boasts fascinating historic sites, intriguing ancient ruins, and gorgeous beaches. 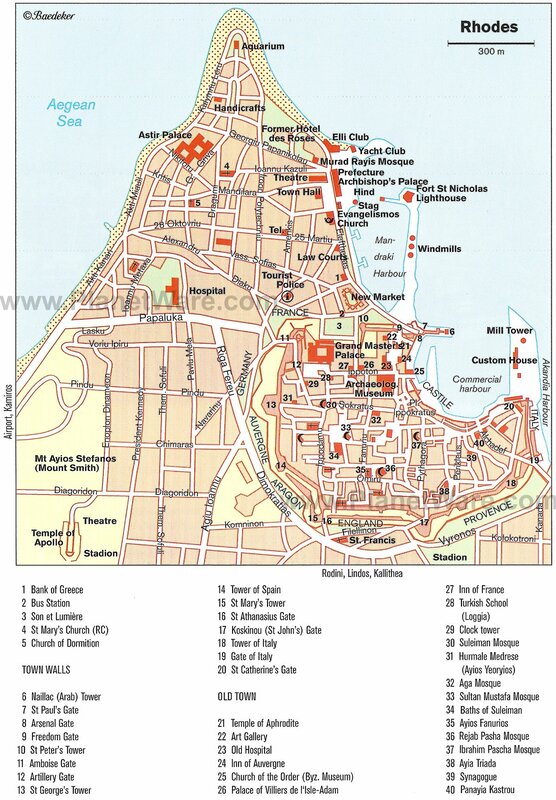 The UNESCO-listed Rhodes City was a base for the Order of Saint John Knights from Malta who defended against invading Turks. The town is surrounded by 15th- to 16th-century walls complete with towers, bastions, and a moat. Visitors may take a walk around the ramparts starting at the square in front of the Grand Master's Palace then take a detour to the nearby archeological museum housed in the 15th-century Hospital of the Knights. Also within the city walls are ruins of the third-century BC Temple of Aphrodite. At the harbor of Rhodes, try to imagine the magnificent Colossus of Rhodes (one of the Seven Wonders of the Ancient World), a statue of the God Helios that once stood here in the third and second centuries BC. The quaint seaside village of Líndos is worth visiting to see its 15th-century Church of Panayía as well as the ancient Castle and Acropolis on the hilltop. At the Acropolis is the temple of Athena Lindia, a small fourth-century-BC shrine in a grandiose setting. Sandy beaches and a scenic coastline add to the village's tourist appeal. From Rhodes, tourists have many island-hopping possibilities. The Island of Symi is an easy journey, about an hour away by ferry. Symi is prized for its tranquil natural environment and the charming old town of Chora. 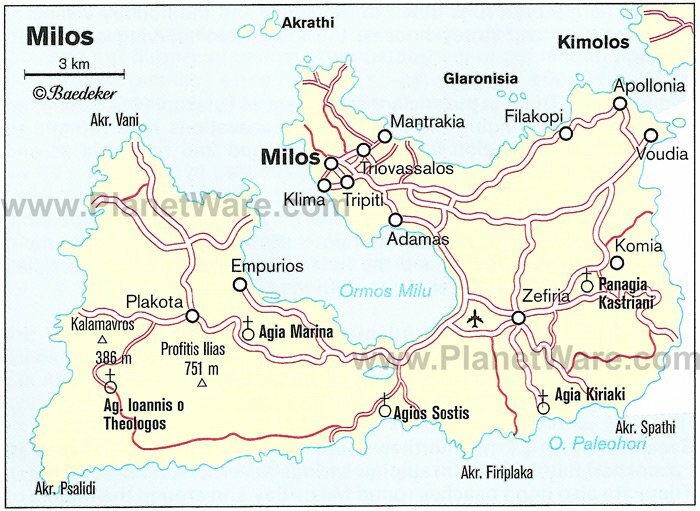 Rhodes is also well connected by ferry lines to the Greek Islands of Kos, Patmos, Santorini, and Mykonos as well as to other destinations in the Mediterranean. 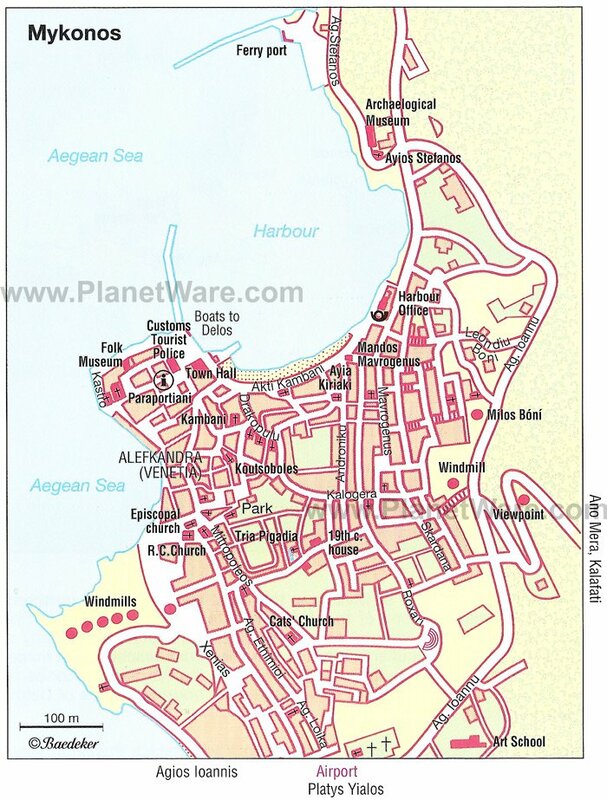 Rhodes is only 18 kilometers from Asia Minor and is accessible to the coastal cities of Bodrum and Marmaris in Turkey. Longer ferry rides take travelers to Cyprus, Egypt, and Haifa in Israel. An island of rugged natural beauty, Corfu is believed to be the place described in Homer's Odyssey where Ulysses met Princess Nausicaa. Green rolling hills cover the south of the island, dramatic limestone hills appear in the north, and marvelous sandy beaches encircle the entire island. Crystal-clear waters and sunny weather add to the appeal. During summer, tourists come for the sun, sea, and relaxation. The most popular beach with British tourists is Kavos, which has parasol and lounge chair rentals, snack bars, and cafés. Issos is a sandy beach with watersports. Sidari beach is family friendly because of its safe, shallow waters, and Ypsos beach also has calm shallow waters and great amenities. Corfu is also rich in cultural heritage and is the most cosmopolitan of the Greek Islands. The beautifully preserved Corfu Town is a UNESCO World Heritage Site, with many historic buildings from the era of Venetian rule. Wandering through the cobblestone streets and gardens of Corfu Town leads to a discovery of Renaissance palaces, Baroque churches, and classical villas. A special feature of Corfu Town are the vaulted passageways called kantoúnia, similar to those in the medieval quarters of Genoa and Naples in Italy. During the 19th century, the city attracted many European aristocrats, who built splendid mansions here. A legacy of this noble past, the Listón is an arcaded promenade lined with elegant cafés. Other must-see sights are the Church of Agios Spyridon, which houses the relics of the island's patron saint (Spyridon), the archaeological museum that displays artifacts from the Temple of Artemis, and the Byzantine Museum that exhibits religious objects from the 15th to 19th centuries. Known for its beautiful beaches and charming villages, Náxos is the biggest and the greenest island in the Cyclades. Impressive mountains give way to verdant valleys, dramatic gorges, and a scenic coastline. The capital city, Hóra, is a colorful seaport with typical Cycladic cubic houses, Venetian mansions, Catholic churches, and an imposing old castle. A must-see sight in town is the archaeological museum with a collection of objects from the Early Neolithic to the Early Christian periods. Be sure to visit Naxos' traditional mountain villages, where the rural communities keep centuries-old customs and wear traditional costumes. Apérathos is a dreamy little town full of cubic houses, picturesque squares, and narrow alleyways. This village also has an interesting historic church, Panayia Drosiani, from the Early Christian period. Filoti village boasts the biggest Byzantine church of Nàxos, Panayia Protothroni. In the Sagri province are more Byzantine churches as well as the windmills typical of the Greek Islands. Near Sagri, tourists will find the sixth-century-BC marble Temple of Demeter and Apollo. Throughout the peaceful countryside are lovely old churches, serene monasteries, and weathered Venetian castles. Nature sites are also popular tourist attractions on Naxos. The island has wonderful hiking trails from the village of Apérathos to Moutsouna Beach as well as a more challenging climb up the slopes of Zas Mountain. Traditional culture is another interesting aspect of visiting Naxos. In many villages, the locals cherish age-old customs and celebrate annual festivals. Summer is the best time to experience the regional festivals and cultural events. September is also a great time to visit for the Fisherman's Feast. Covered with pristine woodlands, the lush island of Sámos is the mythical birthplace of the Goddess Hera. The island boasts one of the most important sanctuaries of the ancient world, the Heraion, a sanctuary dedicated to the Hera. According to a legend, Ionian settlers led by Prokles found a wooden image of Hera caught in the branches of a willow tree, and they set up an altar beside the tree. During the classical era, a processional route led from the town of Sámos to the Heraion. This Sacred Road (now a UNESCO World Heritage Site) was adorned with votive statues, currently replaced by replicas. The original statues are displayed in the Sámos Museum. Highlights of the museum's collection are the Archaic era colossal marble statue from the Heraion and a larger-than-life-size sixth-century-BC female figure that is a counterpart to the famous Hera of Cheramyes in the Louvre Museum in Paris. Another amazing archaeological site on Samos is the UNESCO-listed sixth-century-BC Aqueduct of Eupalinos in Pythagoreion, considered the 8th Wonder of the Ancient World. The island of Sámos also offers natural wonders and inspiring hiking trails. Mount Kerkis is a great place for nature walks to admire rare plant species and birds of prey. For seaside relaxation, the beaches in Marathocampos have excellent facilities. Chryssi Ammos and Psili Ammos are fine beaches, ideal for sunbathing. Livadaki and Potokaki beaches host annual beach volleyball tournaments. This sacred island is known as the "Jerusalem of the Aegean" because it is believed to be the place where Saint John wrote the Book of Revelation. Patmos has been designated as a "Holy Island" by the Greek Parliament and a World Heritage Site by UNESCO. The ancient Romans used this island as a place of exile; Emperor Domitian exiled Saint John here in the first-century. According to legend, Saint John wrote the Book of Revelation in AD 95 in a cave where he heard the voice of God. The Holy Monastery of the Apocalypse (Moní Apokalypseos) was built into this sacred cave. Between the port of Skála and the town of Patmos, this castle-like monastery was built in 1088 by the monk Christodoulos Latrinós and is a center of cultural and religious activity. During Holy Week and Easter, the monastery comes to life with festive celebrations. In Patmos town, the Monastery of Saint John the Divine is renowned for its treasury/library, which boasts a collection of about 2,000 ancient books including parts of a sixth-century manuscript of St. Mark's Gospel. The monastery's church (Katholikón) also has noteworthy 14th-century frescoes in the refectory. The island of Patmos is also ideal for beachside relaxation, nature walks, and hiking. Much of the island offers stunning natural scenery, especially the picturesque coastline with its dramatic cliffs. Sun-worshipers and outdoorsy types will appreciate Kámpos beach, complete with water sports facilities and restaurants. Another popular beach is in the village in Grikos. The lively port town of Skála has many traditional bakeries and charming cafés as well as seaside tavernas that serve fresh-caught local fish. Gorgeous natural scenery, stunning beaches, and charming whitewashed villages attract many visitors to Paros Island, in the heart of the Cyclades. Parikía, the capital of Páros, is a quaint village with typical whitewashed cubic houses, elegant Neoclassical mansions, and the important sixth-century Church of Panayia Ekatontapyliani. The church houses the Parikía Byzantine Museum, which exhibits icons and art works from various other churches and monasteries on the island. The archaeological museum is also worth visiting to see artifacts uncovered at the island's ancient monuments. Other noteworthy villages on Paros include Náoussa, a port town with a charming harbor; the mountain village of Léfkes surrounded by a lush landscape; and the hilltop medieval village of Márpissa near the popular Loyarás beach and Písso Livádi beach. Another tourist highlight is the 17th-century Monastery of Ayios Antonios. The island also has many scenic hiking trails. From Paros, tourists can take a ferry to the smaller island of Antiparos. This tiny island (islet) is an idyllic place with quiet beaches and a whitewashed village featuring bougainvillea-trimmed cubic houses. Almost completely undiscovered by tourists, the pristine Island of Folégandros lies between Milos and Santorini. This romantic island is a place of sublime natural beauty. The cliff-fringed eastern part of the island is rugged and barren; the western half is more lush with water from springs and terraced hillsides of farmland. The town of Hóra, the island's capital, is a charming cluster of whitewashed houses with bougainvillea-trimmed balconies and pleasant town squares. High on a cliff, 200 meters above the sea, stands a 13th-century Venetian castle, the Kástro, where the sea views are stunning. A stone pathway leads up to the Church of the Assumption of the Virgin Mary, which has ancient statues in its garden. Lime trees flourish in this area, adding a delightful perfume to the breezy sea air. Be sure to also visit the Karavostasi, the picturesque harbor of Folégandros that is lined with restaurants, hotels, and shops. For an interesting getaway, take the ferry (about a one-hour-and-20 minute ride) from Folégandros is the Island of Ios, a lovely little island with sun-drenched rolling hills, golden beaches, and typical Aegean architecture. The whitewashed village of Khóra (Chora) features churches with bright blue domes and characteristic Greek windmills. According to an ancient tradition, Homer's mother, Klymene, was a native of Ios and he himself was buried on the island. An even more remote destination is the Island of Síkinos (a 25-minute ferry ride from Ios). Here, the landscape is rugged with rocky hills and dramatic cliffs. Lefkáda Island is an idyllic destination in the Ionian Sea of Western Greece, an area blessed with a pleasant, mild climate. Less touristy than other Greek Islands, Lefkáda has preserved its rural lifestyle. Locals make a living through farming, fishing, and artisan crafts such as embroidery, lace, and knitwear. Most tourists come to enjoy the island's expansive sandy beaches, prized for their crystal-clear seas. The best beaches around Lefkádas town are Porto Katsiki, 45 kilometers away, and Egremni Beach, 30 kilometers away. Lefkáda is also a great place for hiking and nature walks; the island boasts splendid scenery of green rolling hills, rocky limestone mountains, and magnificent waterfalls. The peaks of Mount Stavrotás run southwest to Cape Doukáto, where the island's main town of Lefkáda town lies. Lefkáda town is well prepared to welcome tourists with its abundant selection of restaurants and hotels (from luxury hotels to budget apartments). Other interesting destinations on the island are the traditional village of Poros nestled on a hillside above the sea, the port town of Nidri near many nature sites, and the quaint fishing village of Ligia. These towns also have many restaurants that serve excellent seafood and regional cuisine. Local specialties include Savoro, fish seasoned with vinegar and raisins, and Bourdeto, fish cooked in a savory tomato sauce. For a peek into the world of a bygone era, visit the quaint traffic-free island of Hydra. Once tourists arrive at the harbor of Hydra (the island's main town has the same name), the only way to get around is by walking or taking a donkey ride. The locals still rely heavily on donkeys for transportation. Typical of the Cycladic Islands, whitewashed and colorfully painted houses are nestled on slopes that tumble down to the water's edge of the port. Elegant 19th-century shipowners' mansions line both sides of the harbor. On the quay is the 17th-century monastic Church of the Panayía with a beautiful cloister, while the ruins of a medieval castle preside over the town on the west. Because of its special Old World charm, the town of Hydra attracts many artists especially painters. The island is also known for its artisan crafts, such as handcrafted jewelry, pottery, embroidery, and leather goods. Browse the island's boutiques and sample the local culinary speciality of amygdalotá (almond cake). Hydra does not have any beaches and appeals mostly to tourists who are seeking traditional Greek Island ambience. On Kárpathos, visitors can escape to a remote Greek island with peaceful natural scenery and uncrowded beaches. A rugged landscape of limestone hills extends along the whole length of the island. Along the coastline, cliffs fall steeply down to the sea, with small sandy beaches edged by numerous caves at the southern end of the island around Arkása and on the east coast at Pygádia. The local economy still depends on traditional industries such as farming, handcrafted ceramics, handmade textiles, and artisan wood crafting. 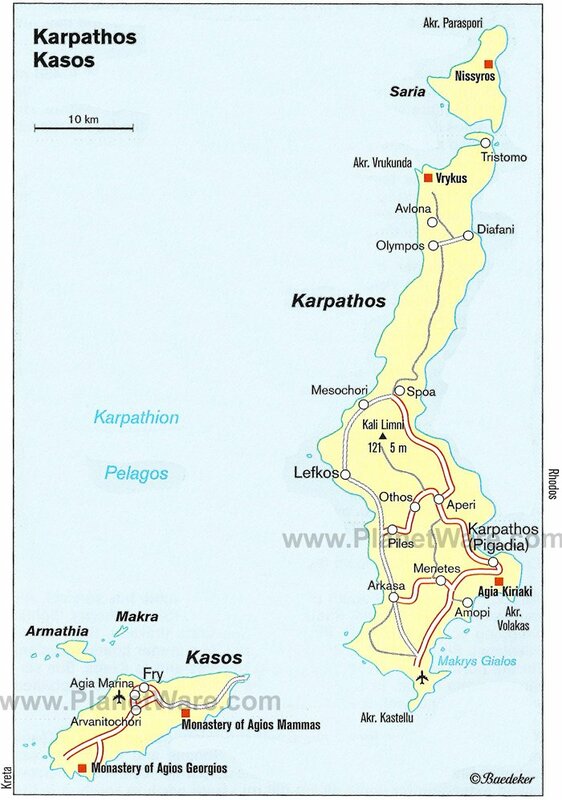 The island's main urban center is Kárpathos town, which has a charming fishing harbor but is mostly a modern town funded by Greek immigrants from the United States. Nature lovers will want to visit the Olympos National Park, an enormous nature reserve of nearly 4,000 hectares known for its walking trails. The landscape features pristine forests and mountainous terrain. This blissful island lives up to Homer's mythical descriptions in the Odyssey. Surrounded by the gentle Ionian Sea, Ithaca offers rejuvenating scenery and quaint little villages. It's a great escape to nature for those seeking relaxation or a place to practice outdoor sports. Hiking, kayaking, and scuba diving are popular here. The island also has wonderful quiet beaches at Filiatró, Dexá, and Aetos. 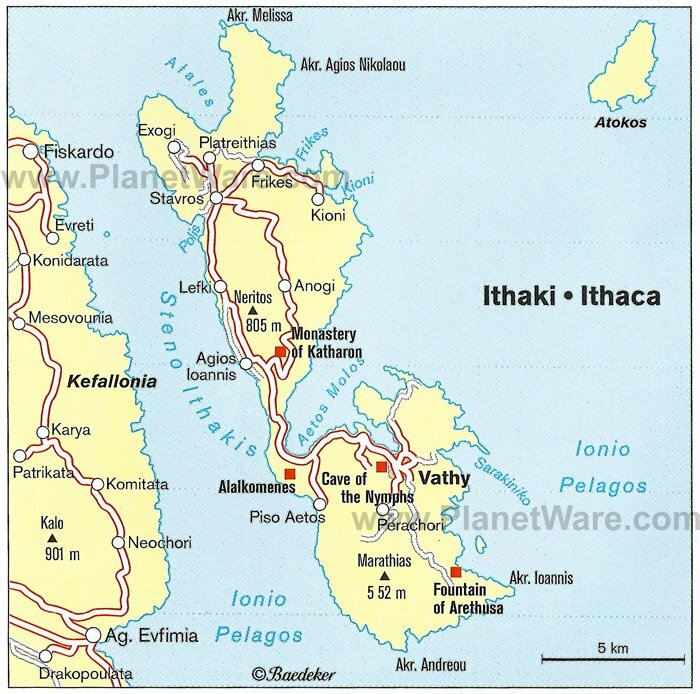 Ithaca's capital, Vathy, is a pleasant seaside town characterized by typical Greek Island architecture, with excellent folklore and archaeological museums. Other interesting destinations are Stavrós village, which has a fantastic archaeological museum famous for a 2,000-year-old clay mask, and Perahóri village, near the Afentikós Lógos Forest, which conceals interesting medieval ruins among the grand old oak trees. A short ferry ride away is Kefalloniá Island, the biggest island of the Ionian Sea. Kefalloniá has magnificent natural scenery of beaches and mountains as well as a rich cultural heritage. Historic sights, such as ancient castles and remote monasteries, are dotted all over the island. The people of Kefalloniá are also known for being friendly and down-to-earth, which makes the island a welcoming tourist destination. The island of Milos in the Cyclades has a distinctive landscape because it was formed from the caldera of a volcano, like Santorini. Milos Island is famous for its gorgeous coastline with beaches of yellow, white, red, or black pebbles, and the water is prized for its deep-blue color and crystal-clear quality. The island's main town, Pláka has an impressive Venetian fortress on top of the hill and the notable Church of the Panayía Thalassítras. The archeological museum in Pláka displays a copy of the Venus de Milo (the original is displayed at the Louvre Museum in Paris) as well as other finds from various periods.